This week on PopMatters, I expand on the theme of survival in Tomb Raider. It's something Jorge and I talked a little bit about in this week's podcast, but it continued to stick with me long after finishing the game. I may have come off as a little extreme, so let me clarify: I don't think every game needs to be a roguelike. Not every game needs to be Minecraft. Gameplay abstractions are a necessity, otherwise it would be like QWOP every time we tried to make Lara jump. However, I do think a game like Tomb Raider does itself a disservice by leaning so heavily on its plot and aesthetics to communicate its themes. The environmental detail, character animation, and voice acting are outstanding, but the themes of danger and desperation are blunted after the cutscenes end. 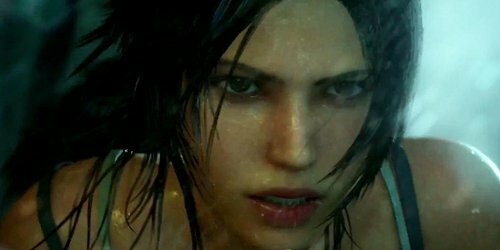 Lara and company say they have to worry about hunger, the weather, and injuries, but none of these things (aside from one instance where your control of Lara is briefly compromised by an injury that is magically solved by the next cutscene) actually impact the moment-to-moment gameplay. Accepting Tomb Raider as a survival story requires heavy buy-in to what the game tells and shows you, as what you'll feel will be something different. There's very little penalty for abandoning the hunting mechanic. I probably killed fewer than ten animals and still managed to nearly max out all the weapons and abilities. Unexpected injuries are nonexistent and the penalty for trying an ill-conceived jump is negligible, the major penalty being the gruesome death animations that get less shocking each time they're repeated. BioShock Infinite's leniency is harsh by comparison. There aren't any heavy emotional or social choices to make amongst Lara's crew. Everything plays out in a preordained way. Again, it's not that there isn't a place for more scripted, plot driven game experiences, it's just that these incongruities are just going to get more apparent as time goes on. This new Tomb Raider was billed as having reinvented Lara as a grittier, more grounded character. There is some truth to this, especially when it comes to the story, dialogue, and visual effects. But when it comes to picking up the controller, the pressure of survival melts away, leaving an experience that is actually not that far removed from the days when Lara would perform standing backflips while shooting tigers in the face.